This is an experiment on Slideshare. This is…A Tale of Two Decks. Note: All videos from the ICC conference are available online. 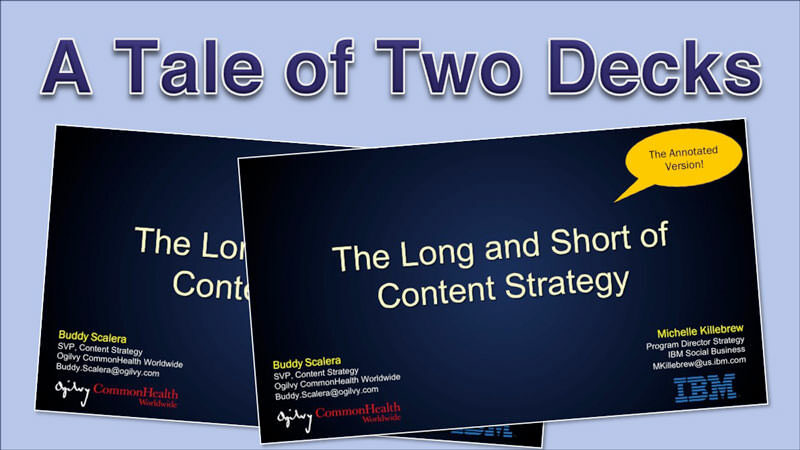 Watch the video of our Long and Short presentation. This is my Intelligent Content Conference 2015 Recap blog post. Usually the best way to understand a presentation is, well, to see it presented. Realistically, there are only so many conferences any one person can attend, so a lot of us check out Slideshare for interesting and useful presentations. We planned to simply upload the deck, but that would lose some meaning, since we can’t be there to offer the voice overs and other descriptions. I’ve uploaded other decks in the past, most of them about healthcare marketing and visual storytelling. The decks are clear during the presentation, but would be a bit vague if you didn’t see it presented in person. This was a busy year for me in terms of presentations and appearances. Content marketing has become a hot topic, so these days I’m out there talking about some of the how-to elements of getting started. A few people have mentioned that I need to keep track of these speaking appearances better, so I created this post to document 2013. 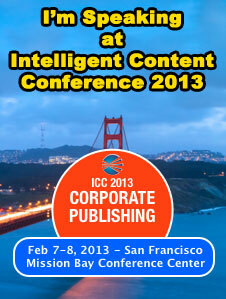 The year kicked off with the Intelligent Content Conference 2013 in San Francisco. This event is one of the most technically advanced events, so the speakers are encouraged to talk about the how-to aspects of creating intelligent content. One of the organizers is Ann Rockley, who is an industry thought leader on XML-driven content. The other organizer is Scott Abel, the Content Wrangler, who is deeply involved with the technical details behind content management across multiple channels. Anyway, I spoke at the ICC 2013 and delivered a presentation called “Channel-Agnostic Content Strategy for Happy Marketers.” It’s a deep dive into how content needs to be developed and managed to flow across multiple platforms. We had slightly tighter time slots, so the idea was to get into your story fast. It was a good approach that stripped out the fluff and forced you to get into the specifics of content formatting. West Coast! It’s been a long time since we’ve seen each other, maybe too long. Let’s get together at the Intelligent Content Conference 2013 in San Francisco on February 7-8, 2013. I’m packing now to bring some East Coast fun to the City by the Bay. Learn why “intelligent content” is an inevitable future for multi-channel marketing. Developing channel-agnostic content is rapidly becoming the only way to address the proliferation of emerging channels and new devices. Brands are publishers and content is liquid. Marketing teams need to consider how to share messages across the platforms that their customers are using. Intelligent, channel-agnostic content development, governance, and maintenance will ensure that your marketing team is happy (i.e., employed) and prepared for the future. Scott McCloud is a comic book creator who wrote a brilliant book called “Understanding Comics: The Invisible Art ,” which is an amazing read, even if you don’t like comics. He masterfully breaks down the medium so that it becomes clear why comics connect with the brain to communicate stories. A few years back, McCloud gave a talk at TED (Technology Entertainment Design), which is an annual conference in California. 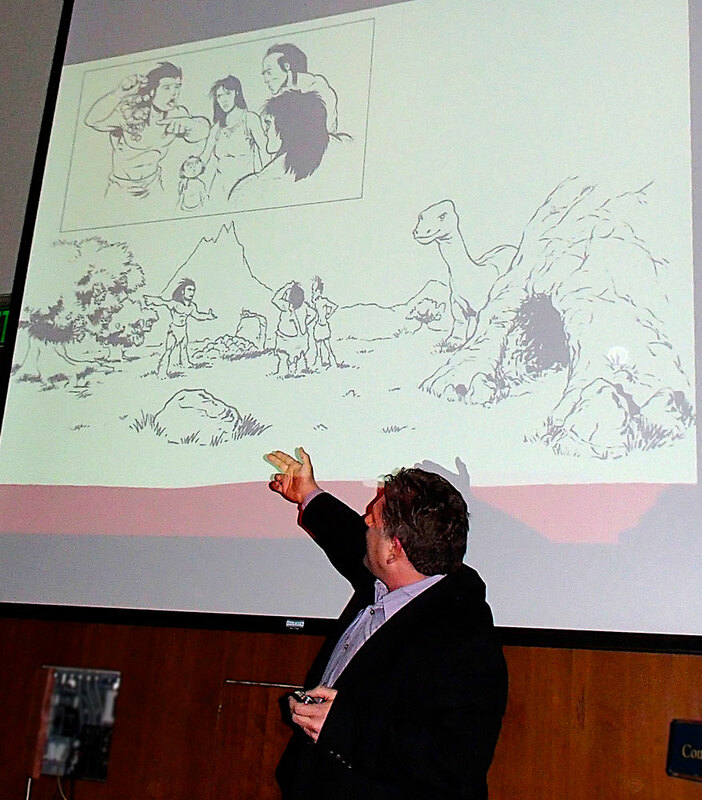 Not only is McCloud a smart guy who knows a lot about comics, technology, and science…he’s a terrific presenter. Check out this video as he discusses how comic books and computers are evolving to leverage new technology. Good stuff. It’s especially compelling considering the implosion of traditional print publishing. As a marketer, you have to get out there sometimes and interact at events. I was fortunate to be invited to be a faculty speaker at ExL Pharma’s “The 3rd Pharmaceutical Search Engine Marketing Strategies Conference: Best Practices for Integrating SEM into a New Media Mix.” The conference was held in Princeton, NJ, which is a really inspiring location. This was a smaller, more intimate conference, which was nice because you really got to engage with the speakers. In a larger room, you can sometimes get overlooked in the conversation. But here, we could really ask questions, get involved, and interact. During my part of the conference, I discussed interactive content and how it affects search engine optimization and some of the latest SEO techniques. Of course, it was a pharma marketing discussion, so everything I presented was customized to the needs of the audience. Significant changes/shifts in SEM for Pharma over the past 12 months: What is new right now? During my presentation, I really tried to engage the audience and invited them to participate. I used one of the core decks our agency uses to pitch new SEM business, but modified to to be more educational and less sales oriented. It was a good deal more colorful with larger pictures and fewer words. There were several really impressive SEM/SEO presentations over those two days. And even though I do this full time, I found myself discovering new techniques and perspectives that helped me improve at my job. That alone was worth the price of admission. Plus, it was really interesting to see how several micro-bloggers used Twitter to cover the convention for people who could not attend. I need to offer special thanks to Jason Youner and Shawn O’Hagan for inviting me to participate at their event. Here’s my bio from the ExL Pharma event. Kind of cool to be called “faculty.” I like that. Makes me wish I had gotten an MBA or something so I could teach at the college level.